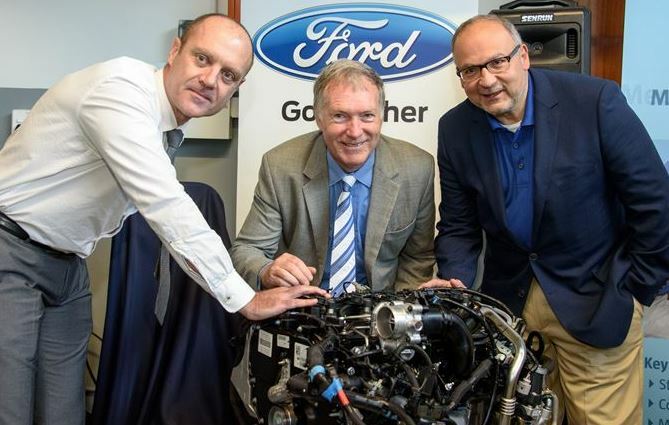 Ford Motor Company of Southern Africa (FMCSA) has donated two locally produced Duratorq TDCi engines to the Nelson Mandela Metropolitan University (NMMU). The high-tech turbodiesel engines were handed over to the university's Ford Engine Research Unit (FERU) by Jim Vella, President of the Ford Motor Company Fund, and Ockert Berry, FMCSA Vice President Operations, at a special media event. The Duratorq TDCi engines are machined and assembled at Ford's Struandale Engine Plant in Port Elizabeth, and power the highly successful Pretoria-built Ford Ranger that is exported to 148 markets in Africa, the Middle East and Europe. These donated engines, comprising the latest 2.2-litre four-cylinder and powerful 3.2-litre five-cylinder units, will be used by FERU - which is part of the university's Department of Mechanical Engineering - to expand the development of engineering expertise, and facilitate engine testing and research amongst its students. Ford's Struandale Engine Plant already has a partnership with the NMMU, which commenced with the launch of FERU in 2012. The facility conducts independent engine testing for Ford, while also creating reciprocal training and research opportunities between Ford and the university. "Education and skills development is a core component of Ford's Better World philosophy, which aims to uplift communities and improve people's lives," Vella said. "We are proud to see Ford forge an even closer alliance with NMMU, creating greater opportunities for skills development, and generating a pool of automotive engineers for the future." Over the next five years, the Ford Fund, which is the philanthropic branch of Ford Motor Company, is investing $4-million towards community building across the African continent. This includes the announcement of the new Ford Research and Engagement Centre (FREC) that will be opened near Ford's Silverton Assembly Plant in Pretoria. The new centre, which is modelled on the highly successful FREC in southwest Detroit, is scheduled to open in October this year. It will become the first international expansion of this concept, with Ford Motor Company Fund investing more than R2-million annually to provide job training and entrepreneurial development for approximately 200 people a year.